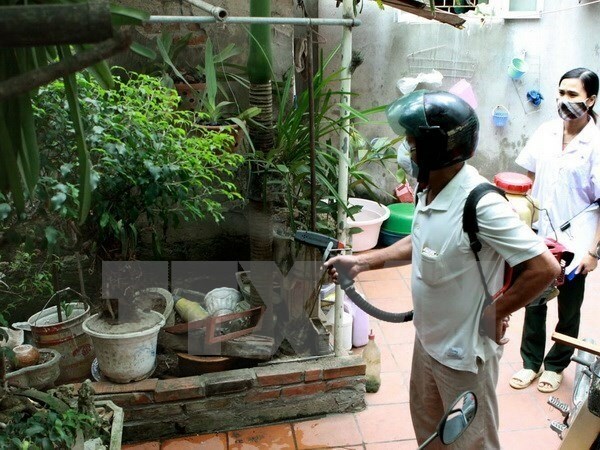 Hanoi (VNA) - Nearly 5,000 additional cases of dengue fever have been detected in Hanoi within the last two weeks, including six fatal ones. This raises the total number of people contracting dengue fever in the capital to more than 13,200 since early this year. The sixth patient, who reportedly died of dengue fever on August 9 night at the National Hospital for Tropical Diseases, was a 56-year-old woman from Thanh Xuan district. She was hospitalised five days earlier with cardiac arrest and multi-organ failure. The five other fatalities were from the capital’s Hoang Mai, Dong Da, Ba Dinh and Ha Dong districts. Data from the city’s Centre for Preventive Medicine show that 90 percent of dengue patients live in the districts of Hoang Mai, Dong Da, Thanh Xuan, Ha Dong, Cau Giay, Hai Ba Trung, Thanh Tri, Thanh Oai, Thuong Tin, and Hoai Duc. Dengue fever generally mimics flu symptoms and goes away within a week, but some cases can be more serious and require hospitalisation. The rapid increase in the number of dengue fever patients has pushed hospitals into overload, including the National Hospital for Tropical Diseases, Bach Mai Hospital, Thanh Nhan Hospital and Dong Da Hospital. The National Hospital for Tropical Diseases on August 9 had to use its meeting room to set up 20 beds for patients. That morning, 500 people arrived at the hospital for dengue-fever examinations. The hospital has a hotline number - 0969241616 - to receive questions related to dengue fever.